One of the wonderful things about our “Village by the Sea” is that you can actually walk around the downtown easily after parking your car or bicycle or hop on the Free Downtown Roundabout shuttle service. Downtown Delray Beach offers parking on-street, in garages, as well as parking lots throughout the area. Parking is accessible and paying for parking is convenient, offering options to pay-by-phone via the Parkmobile App or at the kiosk. On-Street Parking is available for $2/hour for up to 3 hours between 12 p.m. and 9 p.m. Sunday through Thursday and from 12 p.m. to 2 a.m. on Friday and Saturday. Locations: Atlantic Ave: Swinton Ave. to the Intracoastal Waterway; Side streets 1 block North and 1 block South of Atlantic Ave.;Swinton Ave., 1st Ave., 2nd Ave., 3rd Ave & 4th Ave.
Beach Parking -- Street parking is $1.50/hour for up to 3 hours seven days a week from 8 a.m. to 8 p.m. Beachside public lots are also $1.50 per hour seven days a week from 9 a.m. to 9 p.m.
Public Parking Garages are free if you arrive prior to 4 p.m. and thereafter a $5 flat fee from 4 p.m. to midnight Monday through Saturday. Parking is free in public garages on Sundays. Handicap Parking is FREE at all public parking spaces and public parking garages and lots in Downtown Delray Beach. Vehicle must have a proper handicap license plate or placard. For additional information, check out the parking brochure which includes a map, convenient information relating to the mobile pay app, beach permit parking and listing of all available parking areas throughout Downtown. 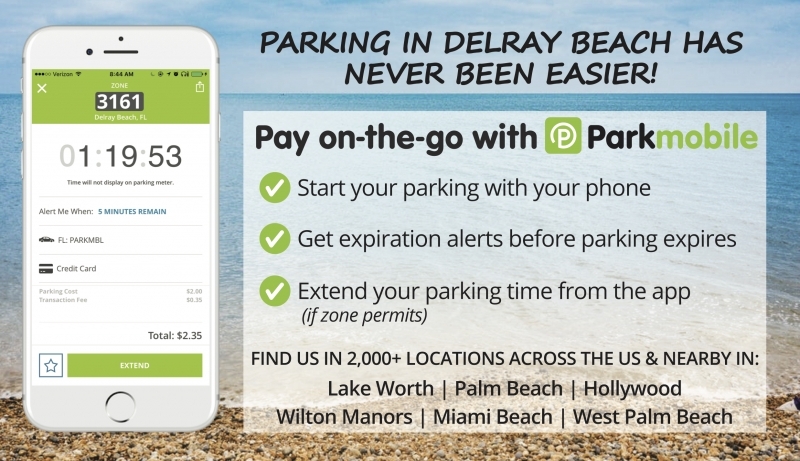 The City of Delray Beach now offers a new Downtown Parking Permit Program for all city residents. Starting on October 1, 2018, city residents will be able to purchase a downtown parking permit. They are valid for one year (expiration date of September 30, 2019). This City Resident Downtown Parking Permit applies to anyone who resides in the City of Delray Beach. Proof of residency is required (see below). Each permit costs $12 per year, valid Oct.1 – Sept. 30. If you purchase the permit after April 1, the cost is prorated to $6. Only two City Resident Downtown Parking Permits are allowed per housing unit. Vehicle registration must be provided for each vehicle. Price is per permit. The permits are valid only in designated garages, surface lots and side-streets in Downtown Delray (this does not include the beach). The permit will allow you to park for free parking seven days a week, between the hours of 12p.m. – 6 p.m. in the designated areas. (Please note, the city does not charge for parking until 12 p.m. daily). Permit holders must abide by posted hourly time limits. Regular time limits and rates will apply starting at 6 p.m. See outlined parking areas on next page. - For garage parking: If you are in the garages before 6 p.m., you park for free all night! (14-hour max time limit applies). available at the designated locations, then this does not permit residents to park at other metered areas without payment. The City Resident Downtown Parking Permit can be purchased online or in person. - Property owners: A current utility bill with the owner’s name along with Government issued ID matching the name, or valid Florida voter registration card with the corresponding Delray Beach address. each vehicle. Price is per permit. - All outstanding parking citations with the City of Delray Beach must be paid or satisfied at the time of permit purchase. 3-North Railroad lot -25 NE Third Ave. / South Railroad lot - 30 NE Fourth Ave. 4-Village Lot - 50 SE Sixth Ave.
5-Gladiola Lot - 51 SE Sixth Ave. SE First Ave., NE First Ave., SE Second Ave., NE Second Ave., SE Third Ave., SE Fourth Ave. & NE Fourth Ave.
*PLEASE NOTE: THE CITY RESIDENT DOWNTOWN PERMIT IS NOT VALID ON ATLANTIC AVE, AT THE BEACH, OR EAST OF THE INTRACOASTAL. For questions about the City Resident Downtown Parking Permit application process, please contact Park Delray Beach customer service at (561) 265-2100 Monday-Friday 8 a.m.- 5 p.m.
38 spaces with parking meters, open sunrise to sundown. 29 spaces with metered parking, open sunrise to 10 p.m.